Celebrating over 25 years in bicycle touring! We are a small husband and wife run company proud to be "hands-on-personal" in all phases of your trip. Our mission has always been to offer guests a deluxe trip — personal hosting and great support, quality lodging, terrific meals and lots of fun additions for history and cultural interests. Itâ€™s all included in a reasonable price. Our fun began in the late 1980s creating and hosting tours for ourÂ hometown bike club. During this time, we also found the delight in travel "on two wheels" logging thousands of miles exploring the world on our bicycles. In our desire to share our excitement with others we created — Bike and the Like! We have hosted close to 200 tours, constantly fine-tuning to provide the most rewarding experience to our guests. 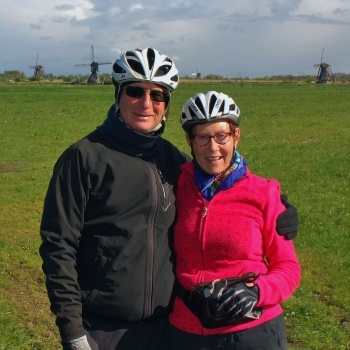 If your cycling vacation with us has been fun and memorable then we've accomplished our mission! Our greatest compliment is when you return to travel with us again! We have been League of American BicyclistsÂ Advocacy Group for over 20 years and volunteer and raise money for bicycling and environmental issues in the areas where we host tours. "Nooks and crannies" — that's our approach to touring. We create routes that entice cyclists to pace their day, stop to enjoy lots of sights, and partake in local history and culture. We love motivating those who want to experience travel by bike! We try to relay as much trip information as possible on our website to get you excited about your travel plans yet not confuse you with too many details. Please contact Suzie: to ask a question about one of our trips or if you need information about cycling in general. She loves to chat with you! If you have a group or organization that is interested in a custom tour, we can tailor most of our trips to fit your timeframe, interests, energy, and budget. Hope to meet you on one of our trips! National Bicycle Tour Directors Assn.